Dr Alan Cheung is a specialist in minimally invasive Robotic Joint Replacement and Sports Surgery. He has also received extensive training in trauma and musculoskeletal tumour surgery. Dr Cheung was born in England. He obtained his medical degree from the Royal Free and University College Hospitals Medical School, London in 2001. He was the recipient of numerous prizes during his training including the Norman Capener Travelling Fellowship and the Ronald Raven Barbers’ Award. He underwent his Fellowship Training in Joint Reconstruction and Musculoskeletal Tumour Surgery at the Royal Prince Alfred Hospital in Sydney, Australia. 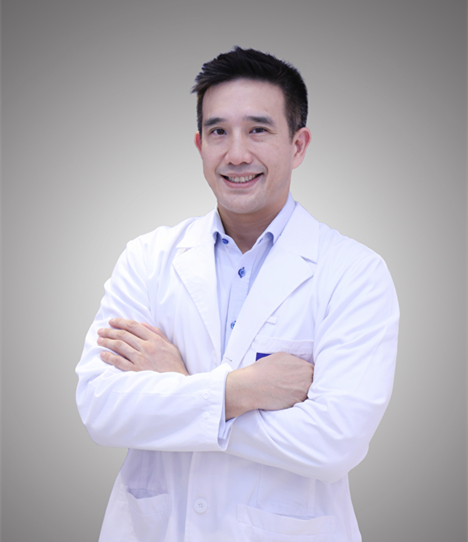 Dr Cheung was previously a Consultant at Ng Teng Fong General Hospital (NTFGH), JurongHealth. Dr Cheung has a passion for teaching and was a Clinical Lecturer at the Yong Loo Lin School of Medicine, National University of Singapore, training medical students and Orthopaedic Residents. He has also been an international Advanced Trauma and Life Support (ATLS) Instructor. In addition, Dr Cheung is regularly invited to teach on courses in the Asia Pacific region, instructing other surgeons how to perform the latest techniques in Adult Joint Reconstruction, and Advanced Sports Surgery. He has published in numerous peer reviewed journals and presented at many international conferences.